Twelve years after the release of The Mask, Julian Roffman revisited both the film and the 3-D process. This time the production was called Mystic Magic and featured the magician Harry Blackwell Jr. and his wife Gay. 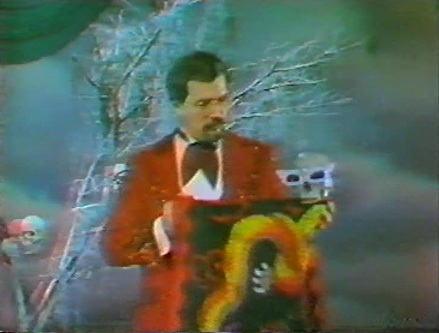 Mystic Magic is little more the original film converted to a 3D Video Process (simply a red/blue anaglyphic conversion to videotape) that added a set of four interstitial segments; each devoting as much time instructing viewers on the set up their colour televisions for an optimal 3-D viewing as it did to the comic quips and magic of Blackwell. The mysterious hooded figures from The Mask’s dream sequences are present, as is much of the dry ice fog, but unfortunately these newly shot sequences lack the dream logic of the films original sequences and are pretty standard television “variety show” fare for the early eighties. 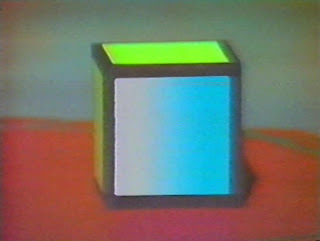 A 3-D setup test for audiences at home. 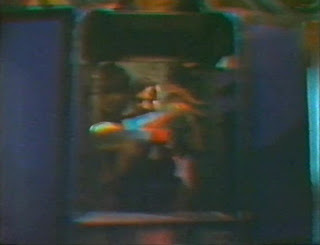 It is also highly likely that this conversion of The Mask, stripped of the Mystic Magic segments, is the source of all the video versions that have been available to this day. But seeing is believing… so I present a sample. 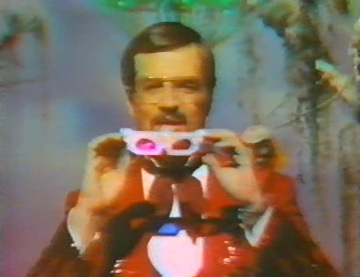 3D Video Corporation quickly went bankrupt as the eighties wave of 3-D came to a close but the damage had been done. When film’s like Freddy’s Dead: The Final Nightmare (1995) where released they chose to incorporate anaglyph 3-D. Now just to defend Dan Symmes (a very passionate 3-D professional and historian); while his company 3D Video Corporation’s television anaglyphs have hurt 3-D’s perception in the public’s mind, he has also done much to defend its reputation, including helping to create The 3-D Film Preservation Fund and presenting two 3-D World Expos (in 2005 and 2007) which screened just about every film made in the 50’s in glorious dual projection. Very cool--did not realize that it was Roffman that shot these!